You have likely seen a Bouillotte lamp shade (think Halloween and boat - say BOO YAHT). 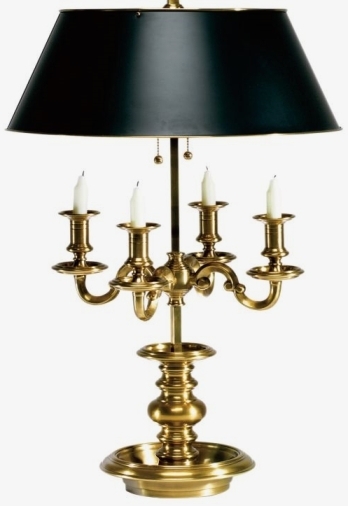 They are commonly found on brass desk lamps that have two or more candlesticks or a candelabra with multiple arms. These shades appear short and squatty compared to most lamp shades. They are commonly made of metal or black paper and painted black with a gold or white inside. Many of these lamps are made with a brass center pipe that holds the shade and which allows the shade height to be adjusted up or down. This adjustable feature is taken from the original candle burning lamps of the 18th century. Bouillotte was a French card game that was very popular during the late 1700's. The originals were candle burning lamps that had a bowl shaped base where the game chips were stored. A central tube surrounded by candle holders (candelabra) held a metal shade. The Bouillotte shade could be adjusted downward to cover and shade the burning candles as they burned lower thereby shading the direct candle light from the players eyes. Modern electric Bouillotte lamps often have this adjustable shade feature incorporated into the design for authenticity although it has no practical use.